An attempted Ukraine-style coup is being mounted in Nicaragua, which curiously enough is receiving little publicity in the imperialist media. We can only speculate that the reason for this is that the US ruling class is irreconcilably divided as to the desirability of the success of such a coup – with one section wanting to prise open the Nicaraguan economy to unrestricted access for US monopolies, and another wanting to keep at bay the flood of Nicaraguan illegal immigrants to the US that would be the inevitable result of the success of the coup. Apparently, Caleb McCarry, adviser for Latin America for Senator Bob Corker, Chair of the Committee on Foreign Relations, has stated that the United States is against the overthrow of the Nicaraguan government and any power vacuum as it seeks the containment of any Central American regional crisis that increases drug trafficking and the volume of migrants. On the other hand, it is clear that the groups perpetrating anti-government violence at the present time are US imperialist trained and financed. In the circumstances, not knowing which side to take, the imperialist media are perhaps mostly for the moment remaining silent, certainly compared to the racket they mounted in support of the so-called Maidan revolution in Ukraine, though the New York Times is of course taking the side of the reactionaries in spite of what Caleb McCarry represents to be the view of the United States government. “Despite always being among the poorest nations in the American continent and the world, Nicaragua has managed, since Ortega returned to power in 2007, to cut poverty by three quarters. Prior to the protests in April, the country’s economy sustained a steady annual economic growth of about 5% for several years, and the country had the third fastest-growing economy in Latin America, and was one of the safest nations in the region. “The audacity of success, of giving its poorest citizens a life with dignity, of being an example of sovereignty to wealthier, more powerful nations, all in direct contradiction to the neoliberal model and its emphasis on privatization and austerity, has once again placed Nicaragua in the crosshairs of U.S. intervention” (Camilio E Mejía, ‘Open Letter to Amnesty International by a former amnesty international prisoner of conscience’). Incidentally, Mr Mejía excoriates Amnesty International in his Open Letter for taking the side of the reactionaries, as indeed it invariably does, in order to defend the interests of imperialism. As a result of the relatively decent life available to them in Nicaragua, there are very few Nicaraguans looking to emigrate, which, for the border-watchers in the United States is the most important consideration. 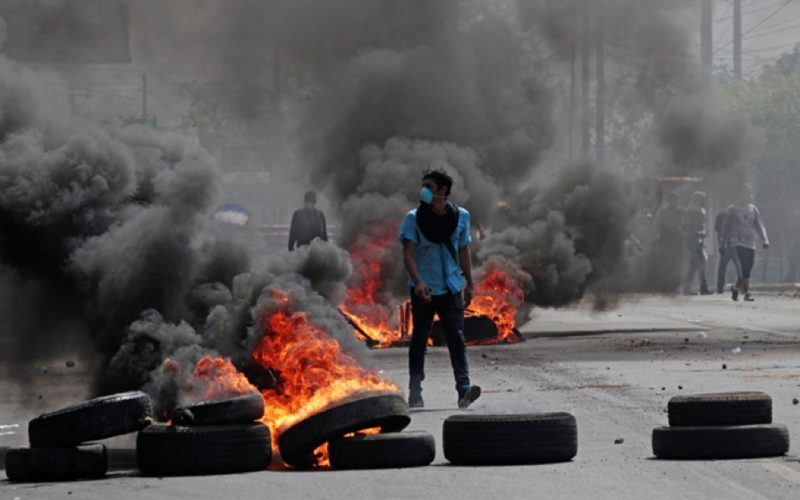 Be that as it may, the fact remains that the Nicaraguan government is facing a vicious assault aimed at overthrowing it. “In Nicaragua, for several weeks now, there has been a situation of widespread protests, which originally were peacefully initiated by university students and other sectors, both against, and in support of reforms of the Social Security Law. Despite the repeal of the reforms by the government, these episodes resulted, in a short time, in widespread violent acts, led by political groups and organizations opposed to the government. “Despite the efforts and call to stop the violence, violent protests by armed demonstrators have continued, attacks against public institutions and other private initiatives such as banks and radio stations (including those close to the government and the Sandinista FSLN party). Armed demonstrators are maintaining road blocks and carrying out criminal acts of intimidation, extortion, kidnappings, and assassination and execution of civilians and police officers, also acts of sabotage, vandalism and looting, which is severely affecting the whole economy, but above all causing fear and tensions among the population. “The road blocks in particular are causing immense hardship to the population, creating food shortages and limiting free movement, which means that people are unable to go to work and many are losing their jobs. Community members attempting to dismantle road blocks have been violently repelled by protesters, who continue to burn and destroy public buildings and personal property, including schools, ambulances and health centres. • Burning down of several public buildings and of houses associated with government officials – and including schools. • Holding the police stations under siege – the remaining police are completely surrounded and unable to get food; police found in uniform are being stripped, beaten up and killed. • At the barricades, mortar-wielding youths interrogate passers-by and search them for evidence of connection with the governing party, those found associated, are then beaten or killed. • Ransacking of almost all the main shops. • 100,000 thousand fewer jobs, 500 million dollars of less income, higher inflation and greater poverty. • An increase in the unemployment rate from 3.7 to 4.2 percent. • Inflation is already having an effect on the main food items. Estimated increase in inflation of 5.5. to 6.5 percent, likely ending with inflation of 7.0 and 8.0 percent. • Over 6000 trucks and crews from many Central American companies have been blocked for weeks impeding intra-regional trade”. It should be noted that the reforms of the Social Security Law, which would have reduced Nicaragua’s pension provisions, were proposed only at the insistence of the International Monetary Fund whose demands the government had considerably moderated in the legislation it proposed. In view of the strong public opposition to the IMF-mandated measure, the government promptly withdrew it, but the reactionary movement unleashed to take advantage of public discontent had established a foothold from which it continues in its violent campaign to overthrow the government. The assault is led by organisations that for years have been funded by such notorious organisations as the US National Endowment for Democracy (NED): between 2014 and 2017, grants totalling $4.2 million were given to organisations in Nicaragua by the NED as part of a US- government-funded campaign to support opposition groups in Nicaragua. It is clear that they have been receiving training in causing chaos, in the hope of provoking the kind of violent response from the government that would certainly be meted out to anybody trying to cause similar trouble in an imperialist country. The legitimate government violence in defence of the interests of the overwhelming majority of the population is then branded ‘tyrannical’ and typically used as an excuse for imperialist intervention. “We denounce these actions which are designed to provoke a coup and the destruction of the constitutional and legal framework of our Christian, Socialist and Solidarity model. “The creation of 58,300 new jobs is at risk and many workers are losing their jobs because of the destruction of public and private institutions. “At the same time, the road blocks are affecting Nicaraguans because they have caused a shortage of basic goods. The road blocks have already caused a loss of $US15 million to the transport sector. In addition, it is estimated that exports will suffer a loss of $US270m and investment will be reduced by some $US150m. “These road blocks are not a form of peaceful protest but an expression of social violence, causing damage to the economy, social stability, food security and emotional wellbeing of Nicaraguan families. As public sector workers, these road blocks are preventing us from providing the kind of quality and efficient service that our people deserve, particularly in health and other areas. We demand the immediate dismantling of the road blocks throughout the country, as they are a violation of the human rights of the Nicaraguan people. “More than a month has passed of instability, anxiety and violence which stops us from working in peace and earning a living for our families, who are those affected by hostile actions which violate our right to free movement and to work. When we do not work for a day, we do not have food in our homes and this is even truer for the 40% of our members who are single mothers and who work day in day out in order to be able to sustain their families. “The road blocks have become an obstacle because they are blocking the supplies of our products, they are blocking our movement and our ability to supply our products to the Nicaraguan people. This is causing significant losses of perishable goods and increased indebtedness. We also reject the illegal and barbaric charges levied at the road blocks by gangs and organised criminals; this can in no way be called a peaceful protest. “We condemn the violence against our sector, against the producers and all Nicaraguans who are suffering acts of violence against them and who are being mistreated just for wanting to reclaim our constitutional right to free movement in our streets, fields and cities. We are lovers of peace, tranquillity and security and we want to contribute to the development of peace and harmony and the development of our country. “NO MORE ROAD BLOCKS! These mean more poverty, more hunger, a slide backwards and less social and economic development in our country. The Rural Workers’ Association, ATC, with 50,000 members, has also called for the lifting of road blocks and has reaffirmed its support for the Government. “The government responded to the protests with a bloody crackdown, firing into crowds of demonstrators and clashing with them at barricades. 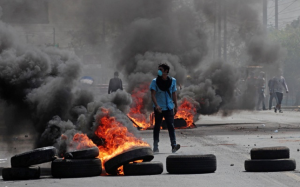 More than 160 people, mostly protesters, have been killed since April, according to the Nicaraguan Center for Human Rights. “On Wednesday, the Inter-American Commission on Human Rights condemned ‘the excessive use of state force,’ including attacks on protesters by ‘parapolice’ squads and other masked gunmen” (Alfonso Flores Bermúdez and Elisabeth Malkin, ‘Nicaragua protests take a new turn: empty streets’,.14 June 2018). Why, one wonders, would government supporters feel the need to wear masks? Moreover, Fabrizio Casari roundly denounces this mythical interpretation of events in Nicaragua as shamelessly peddled by such newspapers as the New York Times and such organisations as Amnesty International. He is outraged that in the media, killers become ‘peaceful students’, when they are neither students nor peaceful. They kill and they burn, they assault Sandinista militants, but the press describes them as ‘victims’ of the Sandinista Youth! Furthermore, he adds, is it credible that demands for ‘more democracy’ and ‘defence of the interests of the poorest’ should be led by businessmen, landlords and the church hierarchy at the head of the demonstrations? And is it credible that the Sandinista government would set fire to the houses and party headquarters belonging to Sandinistas, and to their own vehicles and flags, and that it would destroy monuments and murals honouring Sandinista heroes? And then shoot themselves? (translated from the Spanish in ‘Nicaragua, el engaño mediático’ – Nicaragua, the media fraud, Tercera Información, 10 June 2018). The other question to ask is Why this resort by the opposition to violence? It is obvious that it is because they know they would never win an election. But when inviting the masses to participate in their anti-government activities, they play on people’s criticisms of the government without of course mentioning what political decisions they would take if they were able to take over. Maritza Castillo asks in an article entitled ‘Con humildad quisiera una respuesta…’ (‘I would humbly request a response’) why, if their policies are so much better than those of the present government, do they not rely on elections, especially since these are always held under the auspices of international observers and are subject to every kind of guarantee against fraud? Let them also tell us how they will deal with the social security deficit: who will pay? Let them explain how they will avoid the privatisation of social security that would bring a windfall to the banks, and how much they will ask when they sell off the modern public hospitals built from scratch by the Sandinistas? A moment’s thought will necessarily provide the answer that all policy decisions of the ‘opposition’ will favour not the masses, but the oligarchs and their imperialist backers. Finally, we note that among the opponents of the Sandinista government in Nicaragua there are reputedly former left-wingers who have been disappointed by the failure of the government to abolish capitalism, and by its compromises with imperialism. It is unfortunate that too many advanced workers who have reached the realisation that only proletarian revolution and the establishment of a socialist economy can solve the pressing problems of our era nevertheless fail to see that sometimes compromise with the enemy is unavoidable in the short term – a short term that may last a few years! If Lenin was prepared to surrender vast swathes of territory to the Germans at Brest Litovsk, it was not because he was betraying the revolution but because, at the time, it was the only way to preserve the strength of the revolutionary movement. The Russian masses were sick and tired of war, they needed a respite – hence the absolute necessity for the compromise. The Nicaraguan people too were sick and tired of the civil war waged in their country by the Contras with strong US backing, and, to bring peace to the country, the Sandinistas were prepared to lay down their arms and submit to electoral politics, even after on one occasion they lost the election. The point is always to live to fight another day. We are not in a position to judge whether or not compromise was absolutely necessary, though we suspect that it was, nor whether better terms might have been reached and, latterly, more resistance mounted to imperialism’s outrageous demands, but of one thing we are absolutely sure and that is that nothing good will come from supposed left-wingers backing the cause of imperialism and the comprador class to bring down the Sandinista government. The Nicaraguan government is clearly seen by imperialism as an obstacle to its expansion and must therefore be firmly and reliably supported against imperialism, while continually reminding the masses that the depredations of imperialism cannot in the long term be avoided unless capitalism too is overthrown and replaced by a socialist planned economy. When the masses are ready (and imperialist atrocity is certainly helping to mould their consciousness in this direction) then they will follow the revolutionary leadership to achieve exactly that.